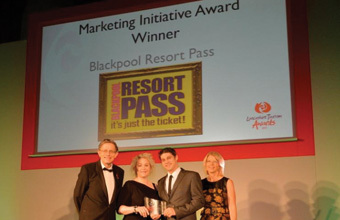 THE Blackpool Resort Pass was named Best Marketing Initiative at an awards ceremony held at Blackburn Cathedral. The pass is the first of its kind in the UK, offering visitors access to up to nine of the resort's top attractions at huge discounts. Marketing manager at Marketing Blackpool Nicola Atanassova said: "We are absolutely thrilled the Blackpool Resort Pass has won this award. "Launching the Resort Pass this year has involved a huge team effort both at Marketing Blackpool and with our partners across the resort, so to win this award is congratulations to everyone who has been part of that. "Targeted marketing campaigns have run across the UK to ensure the popularity and success of the Blackpool Resort Pass and this has clearly been recognised by the judges at the Marketing Lancashire Awards."